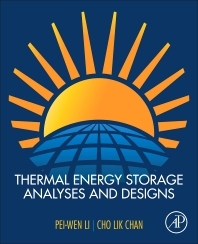 Thermal Energy Storage Analyses and Designs considers the significance of thermal energy storage systems over other systems designed to handle large quantities of energy, comparing storage technologies and emphasizing the importance, advantages, practicalities, and operation of thermal energy storage for large quantities of energy production. Including chapters on thermal storage system configuration, operation, and delivery processes, in particular the flow distribution, flow arrangement, and control for the thermal charge and discharge processes for single or multiple thermal storage containers, the book is a useful reference for engineers who design, install, or maintain storage systems. Dr. Peiwen Li is full Professor in Department of Aerospace and Mechanical Engineering at the University of Arizona. His focus of research and teaching is in the area of thermo-science for energy and power engineering. In the recent 10 years, he has worked on heat transfer and heat storage in energy storage systems. Through systematic studies to the phenomenon of heat storage, his research team has addressed all fundamental issues related to thermal energy storage in single or dual-media materials, with or with no phase change. Dr. Cho Lik Chan is a full Professor and the Associate Head of the Department of Aerospace and Mechanical Engineering at the University of Arizona. His research areas of interests are heat transfer and fluid mechanics. He has worked on several numerical methods, e.g. boundary element method and lattice Boltzmann method. He has applied these methods to simulate laser welding, laser drilling, thermocapillary convection, micro-gravity double diffusive convection, and electro-kinetic flow. In the recent 10years, he has been working on mathematical modeling and simulation of thermal energy storage (both sensible and latent heat) for concentrated solar thermal power systems.